The finest displays of the newest boats retailed in the region will be on display at the one Boat Show that all boating enthusiasts know to attend. 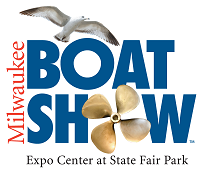 This is Wisconsin's largest boating exposition with over 300 boats from over 75 manufacturers - motor yachts, runabouts, aluminum boats, pro style fishing rigs, pontoon boats, cruisers...you name it! Wake boarding, cruising, sunning, fishing or just hanging out on the water...all are facets of the boating lifestyle and the Milwaukee Boat Show is a celebration of just that. We display in the main lobby. Take a break - stop and talk to fellow boaters! Always several club members to talk to . . . Many different kinds and sizes!